​After years of searching, a wonderfully suitable sire has been found- Joeri Jarno van Parkendijk, pictured above. 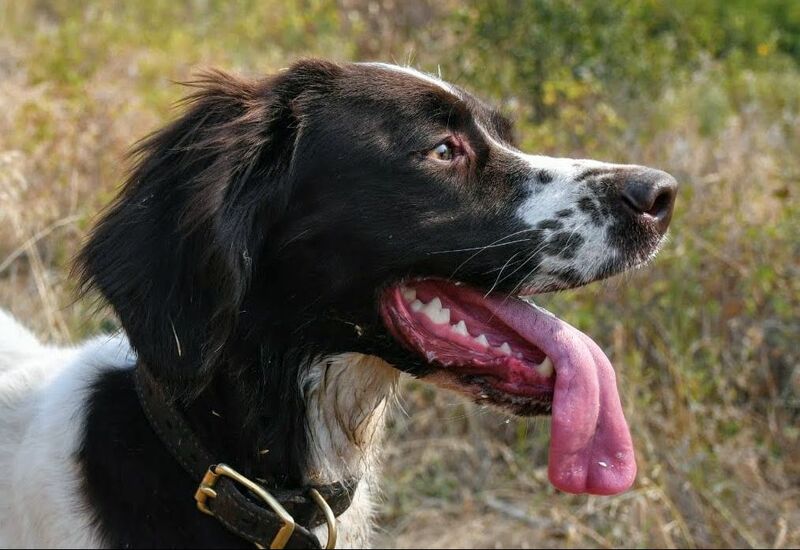 He has an impressive hunting games resume, a great temperament, and of course passes all Dutch & DPCNA health/breeding markers with flying colors. Not only is he gorgeous, he is a very nice build match for Powder. As an added bonus the CoI (Coefficient of Inbreeding) for the paring sits right at 13.5% which is excellent on a number of fronts. We expect pups to be intelligent, biddable, athletic, and just as good in the field as they will be in your home. As of 1 September 2018, we have been actively taking applications for pups to be produced by this mating. This is a very exciting combination and sure to produce some amazing Drents true in type, health and temperament. Mating is expected to occur in the spring of 2019 and pups, if everything goes well, should be ready to go home in late July/early August. If you have interest, please do not hesitate to reach out! As a point of interest, Powder will be the first U.S. bred and born Drent to be taken to The Netherlands to be bred. These are exciting times indeed! 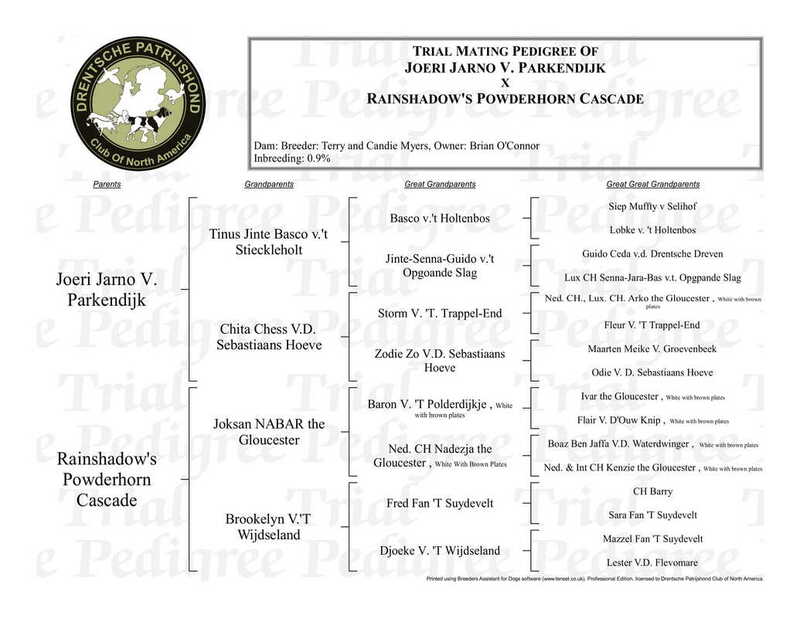 ​DPCNA Approved Dam Rainshadow's Powderhorn Cascade, TBI-Service Dog, CGC. Powder is the daughter of our very own Esp. Ch. Joksan NABAR the Gloucester CGC. She sticks a point like a professionally thrown dart, yet is the biggest cuddle bug of the clan. Intelligent, athletic and as sweet as they come. A foot hunters dream. ​DPCNA Approved Stud Joeri Jarno V. Parkendijk. Like previously used studs, we have firsthand knowledge of him, members of his family tree, and offspring he has produced. As you would expect from a Two Gun selection, he has a wonderful, eager to please attitude and his strikingly good looks make for an ideal Drent. He is a is a good all-round hunter. Powder is a highly intelligent Drent and has proven to be a fast learner and was an obedience class superstar. She is also an incredibly athletic and powerful Drent with the confidence to take on insanely rugged terrain and deep cover most dogs balk at. She has experience hunting Pheasant, Hungarian Partridge, Blue Grouse, Valley and Mearns quail. She is cooperative, backs, sticks solid points and is a reliable finder of downed game. She is also a natural retriever and has a soft mouth as an added bonus. Moreover, Powder is an amazingly sweet and affectionate Drent and my best bud, she is a power cuddler and enjoys her family time. She is a recently certified TBI-Service dog, she achieved her AKC Good Canine Citizen certification at 10 months of age. Others have described Powder as: loves to work in the field, very playful and tolerant. She is easy to live with and adores her toddler Robert. Joeri is a sweet and social dog, yet he has a typical streak of Drent stubbornness to be expected. He is a confident boy who can handle other dogs well and is not aggressive. 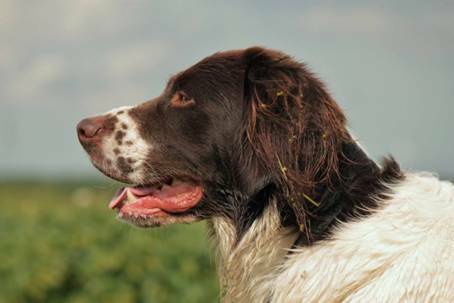 Joeri and his boss regularly participate in hunting in the Netherlands where he retrieves duck, goose, pigeon and hare. Joeri really wants to work during the hunt. Joeri lives in a wetland area so he has no trouble with water at all and is a skilled swimmer. Joeri started hunt training at a young age and has a number of hunting games credentials. In the house he is an easy quiet dog and has never been destructive - other than his toys that is. Joeri has been trained to not lay on the furniture. It should come as no surprise then that he also does not have problems with noises like fireworks. Others have described Joeri as sweet, easy, playful, stable, enjoys to work, very family oriented and an amazingly good dog. What you can expect from this litter: Pups from this litter can be expected to have a very high level of intelligence with a very strong desire to please you. Both parents have good noses for finding game, and a stronger than average instinct to point; range should be short to medium casting between 60 and 80 yards or so. You should expect very typical Drent “pillar” behaviors; highly effective hunters, barking when strangers visit and being first rate family companions. Both of these Drents are extremely biddable with hallmark cooperative sweet personalities and are centerpieces of their households, their pups shouldn't be any different. The CoI for this planned litter is considered to be in the ideal range, and therefore should throw very lovely pups consistent in conformation, temperament and health. Additionally, the selection of parents and pedigrees, this litter could be considered an extension of the prestigious Gloucester line. Both parents are athletic fit Drents able and willing hike and hunt as long as your own legs can hold out. As a note to those being introduced to the Drent: Physical and emotional maturity of the breed is typically slow and nothing we have experienced here suggests differently. When training, low pressure methods of conditioning should be employed with all Drents to achieve the best results for you and your family. It is fair to have very high expectations for what these pups may achieve, however, those interested in big results from very young dogs need to either adjust expectations from the outset or look elsewhere (read: different breed all together). Having realistic expectations for what a pup is ready for is important, and having patience will pay big dividends to those willing to work with these pups. Without question, you will be richly rewarded with a true canine companion. As with keeping a Drent, having a sense of humor is handy to have on hand, even though both are polite and well behaved, they are after all Drents. *Visitors are always welcome and encouraged! Be prepared to drink lots of coffee. *All puppies must be picked up at our home in Spokane, WA. Shipping is only by exception. *We do not allow future owners to "pick" their puppy. We will make selections based on the dynamics of our client list and the pups produced. There is no preference order. *Our Pups will come with health records including proof of worming, 1st set of vaccinations, microchip, and clean bill of health as well as DPCNA and AKC registration. *We allow adults and encourage children to come as well, however children should be supervised and know beforehand how to interact and handle a puppy. We recognize the DPCNA, The Drentsche Patrijshond Club of North America, as the parent organization of the Drentsche Patrijshond, Dutch Partridgedog, in North America as recognized by the American Kennel Club. All of our litters will be registered with the DPCNA and American Kennel Club.